Used Tesla Model 3 cars are already popping up for sale on Autotrader and the prices are dropping. This man got his Model 3 from Tesla and put it up for sale two days later. Today I decided to check if there are any used Tesla Model 3 vehicles available for sale. I went to Autotrader and searched for used Model 3s. To my surprise three vehicles are listed for sale with wide range of prices. Some owners list an asking price of nearly 60,000 USD, the double of what Model 3 costs, and yet another Model 3 owner has its car listed for $102,000. The prices of used Tesla Model 3s have significantly come down. Only few months ago they were going for 150,000 USD. On October 11 The Drive published this story writing about an owner who listed his Model 3 for sale for $150,000. Thus, as you can see Model 3s listed for $59,000 to 102,000 USD are lower than what they used to be only 3 months ago. However, those prices are still the double or triple of the Model 3 base price of $35,000 USD. So here is a man who listed his already-used Model 3 for sale two days later after he got it from Tesla. Here is the description he wrote at Autotrader, which has it as 2017, but the owner says it's a 2018 car. "This car is 2018, not 2017 (autotrader has a bug). I have the car, you can take it home today. I got it brand new from Tesla 2 days ago. Tesla does not allow reservation transfers like some people believe. This is your best chance. This car is super fast and super fun to drive. 310 mile of range, all options. Pure joy. If you order yours from Tesla, waiting list is 2 years long and Federal Tax credit expires in March of this year. The color of this Model 3 is solid black inside and outside as you can see from the image. It only has 32 miles on it. There is another used 2017 Tesla Model 3 listed by Abi Auto dealership and the price is $102,000 USD. I don't know if it has so many people interested or not, but the dealership says test drive is only with an appointment and they want you to let them know before going to dealership. I understand that some people don't want to wait until their Model 3 arrives and perhaps would be willing to pay a little extra. But imagine what car you could buy for 60,000 dollars or for 102,000 dollars. I mean paying for test driving I could still reluctantly understand, but paying 102,000 USD for a car that costs 35,000 when there are so many other cars available for that price, that I don't understand. Let us know please in the comments section how much would you realistically pay for a used Model 3? Your opinion will help to create an interesting discussion and see how people feel about this. So what’s going on with situations like this? 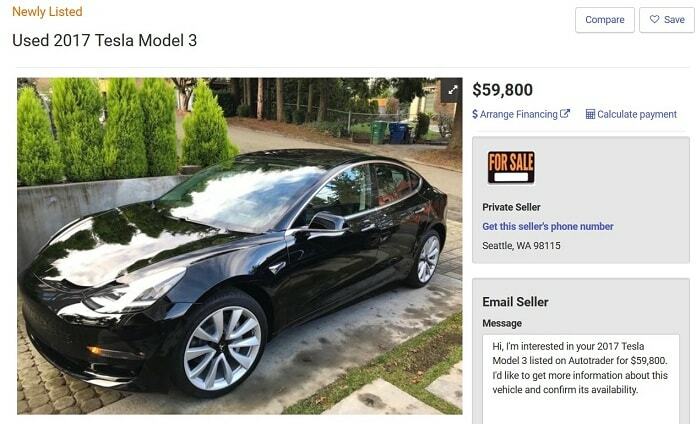 Is the Model 3 purchaser who sells 2 days after taking delivery claiming the tax credit then dumping a full-priced or over-priced car on the marketplace? Is there any protection that prevents that tax credit from being used by a flipper such as this? If not, the tax credits might not be available for those who genuinely want to own the car and are more deserving of it. There are no base $35k Model 3 out there yet, so $59k is not exactly too big of a markup. And how many used model 3 actually sold for $100k+? I personally would not pay more than retail for anything, especially when it is used/a depreciating asset. Nobody is going to pay more than 60k for a Tesla Model 3 now. And those who do buy it are probably companies looking to rip it apart and study it.